An upstate wind energy project has ruffled some feathers with a union that says the company’s not paying workers a fair wage. More than a dozen members of the New York State Laborers Organizing Fund held a rally in front of a Midtown, Manhattan, hotel Wednesday, where the American Wind Energy Association investor conference was held. The laborers blasted the hiring of out-of-state workers to build a wind farm in Lewis County. And the workers won’t get paid the prevailing wage, the laborers said. The rally Wednesday was mostly pointed at EDF Renewable Energy, a California-based company involved in the wind farm project. 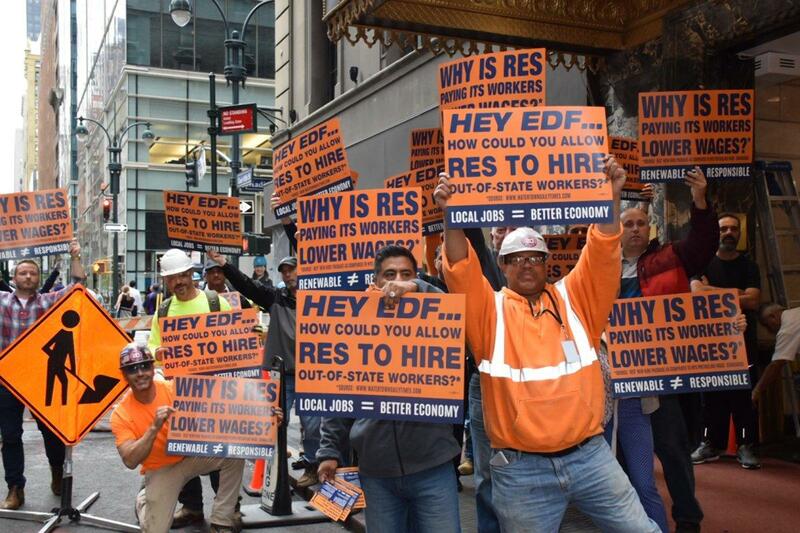 “EDF’s decision to use an out-of state contractor to perform work being subsidized by New York tax dollars is a disgrace,” said John Hutchings, the director of New York State Laborers Organizing Fund. “Public subsidies should come with public responsibilities. We should be using the state’s limited development resources to fund projects that provide middle class jobs,” he said. EDF Renewable didn’t return an email requesting comment. The prevailing wage in Lewis County is $25 an hour with benefits. But according to Laborers’ International Union of North America, which represents workers in about seven upstate counties, the hourly rate on the wind project is roughly $17. LIUNA, which is affiliated with the New York State Laborers Organizing Fund, had hoped to talk more to EDF Renewable about signing up locals at the prevailing wage. But communication has broken down over the past few weeks. The impasse made news just as Gov. Cuomo’s office pushed the state’s commitment for clean energy and green jobs at the Climate Jobs NY Summit last week. Speaking at the summit, Lt. Gov. Kathy Hochul said there are 150,000 New Yorkers now employed in clean energy jobs. The state has plans to develop even more in coming years, with a goal of creating more union jobs, she added.